Bhikkhuni Dhamma Dana is the Founder and Abbess of Panna Vihara, which is located outside of Phenom Penh, Cambodia. 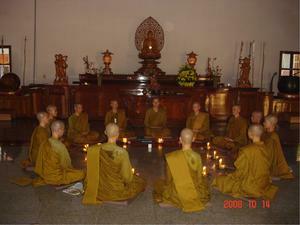 In residence are 13 Bhikkhunis, 11 Samaneris and 10-20 lay people. Their meditation hall is large and beautiful. Their dormitories are very simple; wooden beds with a bedroll, a mosquito net, a pillow and a box underneath for storage. The meeting room, kitchen and dining hall are equally simple. They practice meditation and yoga and have a formal practice from 3-6 am, 8-10.30am, in the afternoon followed by a Dhamma talk and then they practice until 9 pm, when they sleep. They study Pali on Tuesday and Friday afternoons. They are in the process of developing Buddhist education for Cambodians in conjunction with the head of the Sangha and the Ministry of Culture and Religion. They have a building under construction for teaching students from junior high school to university age.